This charger works great - charges within an hour - it does detect bad batteries with a rapid light flashing. Should have come with two color lights (red/green) because when put in a battery to charge it does flash and if you had not seen the rapid flash you might think your battery is bad. B&D should have included this as its charger since its batteries last 20 - 60 minutes and it takes 60 minutes to recharge and with two batteries at least you can finish a project at one time - the charger included takes 8 hours and I'm sure this effects sales and when I tell others of this quick charger they are much happier but some do return their machine because they feel taken. I've had two of these go bad in the last five years. The charge light flashes, but the battery never charges. You can always try another (or all) of your batteries to make sure it's the charger malfunctioning. Unfortunately, you've now ruined EVERY battery that you tried. Stick with the cheapo charger that comes with the products - they never malfunction. Could not find a recharger anywhere until I check here. Works great and a good price. Provides very fast charge. Keeps me on the job, not waiting for batteries to charge. This charger probably does work. I never found out. It does not work for all 18v batteries. I have a cordless drill. The battery has 4 charging blades with blades 3 and 4 grouped in the same section. This configuration will not fit this charger! B&D was gracious on the phone and resolved my dilemma within minutes and Amazon allowed me to return it. 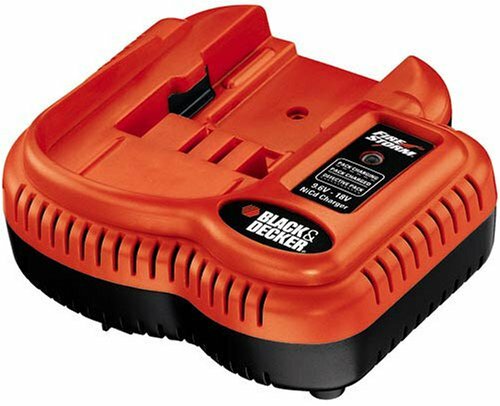 I have many 18v cordless tools and many of the B&D yard 18v tools, so I use a lot of 18v slide-on batteries. This charger is great. 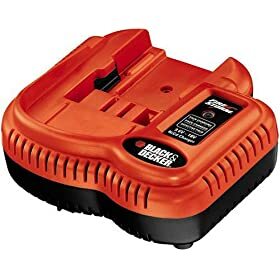 It charges my 18v batteries very quickly and you can leave the battery on the charger without any damage to the battery. I have tried other chargers in the past including the double charger but the batteries would get very hot if left on them and this would reduce the life of the battery. With this charger I do not have to worry, the battery does not get hot. With other chargers I had to quess when the battery was fully charged but with this charger the blinking light tells me it is charging and when it stops blinking the battery is fully charged. It's great, no quessing. I have three of these chargers and keep batteries on them at all times so I always have fully charged batteries when I need them. I would recommend this charger to anyone that wants a charger that charges super fast and a safe charger that you can leave your battery on at all times. A smaller version of this should have shipped with drill. The class 2 transformers break down and can start fires, A smaller version of this should ship with products. Batteries require some charger intelegance for safety and longevity. Charger is working as expected. Should have come with the batteries. Original charger was pure junk. If you have B&D batteries you need this charger. I was concenred about spending close to $30 on this recharger. Let me tell you: it's worth it. The charge is faster and the battery lasts much longer when working it hard. Night and day difference from the standard charger the batteries ship with. I have a grasshog weed wacker, and need to use it about 45 minutes straight on my lot each week here in Florida. So, I use the batteries big time. I have 4 batteries and 2 chargers. The light blinks when charging and then is always on when totally charged. Nice feature. If you need to recharge rarely, it's not worth it. If you use your batteries alot, it is well worth it. Bought this to replace the Versa Pak batteries I keep on charge in our travel trailer. Works as advertised, keeps a spare on charge so if I overuse the drill or blower (got to keep the campsite clean! ), I have a spare ready. This replaced three Versap Pak chargers, freed up a couple of AC outlets. B&D 18v batteries come in (at least) 3 varieties: 1.2, 1.5, and 2.1 ampere/hours. The 1.2 comes with most tools and has 2 terminals. The 1.5 (comes with some kits) and 2.1 "Silver Extreme" (sold as a "high performance" accessory) have 3 terminals - the third terminal apparently detects over charging. 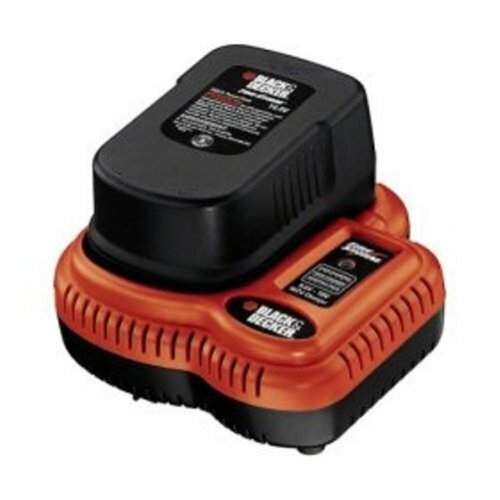 1) "Dumb" chargers that supply a constant charge current/voltage, i.e., like the charger that comes with most B&D products that has the brick that plugs in the wall and a small piece that slips onto the battery; these have 2 terminals. 2) "Semi-intelligent" 2 stage chargers that supply a constant charge current/voltage for charging, but then drop to a "maintenance charge state". These also have 2 terminals. 3) "Intelligent" fast chargers that charge at a faster rate, can sense overcharging and modify charge current accordingly, and then drop to a "maintenance charge state" once the battery is charged. These chargers have 3 terminals. The (dumb) charger that comes with most B&D products that has the brick that plugs in the wall and a small piece that slips onto the battery does charge ALL the 18v batteries in about 6 hours - BUT - the manual warns not to leave the battery on the charger or battery life will be diminished (no "maintenance charge state", just constant contiuous current). Semi-intelligent chargers charge at twice the rate as the "dumb chargers", thereby charging ALL 18v batteries in about 3 hours. These are chargers that come with the 3 piece garden set, dual chargers that come with some combo kits, etc. You can leave the batteries on these chargers "indefinitly" according to B&D. The "intelligent" fast chargers (single & dual) will charge the 2 terminal 1.2 A/H battery in about 3 hours (same as the semi-intelligent chargers) BUT will charge the 1.5 & 2.1 ampere/hour batteries (with 3 terminals) in about 90 minutes. And, you can also leave the batteries on the fast chargers "indefinitly" according to B&D. It got to my house quick and works well. It is a lot better than the one that came in the box. Fast charging. I use 3 batteries for my weed whacker and this can keep up. This charger is so much better than the original one that came with the drill. The charger is easier to use than earlier units produced and is much faster. It plugs into a standard outlet without a large unit blocking use of other outlets. Charger is fast but maybe to fast since one of my batteries will not charge fully. Very expensive when you consider I could have bought a whole new blower for about twice the price that would have included a new charger and two new batteries.